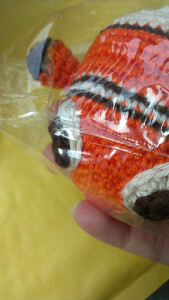 so Nemo got finished and packed and shipped just in time to arrive at its new home. He is being loved very much already, I received a call yesterday telling me Nemo is being soaked up in saliva by its 6-month-old daddy now. So cute. In the end I enjoyed making him a lot, even though I still find working on order to be very very hard for me. I just can’t find enough motivation finishing things. 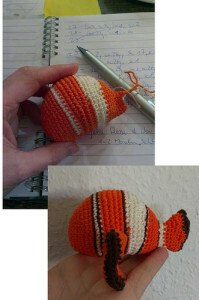 Meanwhile I think about posting the pattern here, I hesitate because of copyright, which of course is not mine, even though I made the pattern from scratch the figure “Nemo” is owned by pixar. Well, a little more thinking on this side. 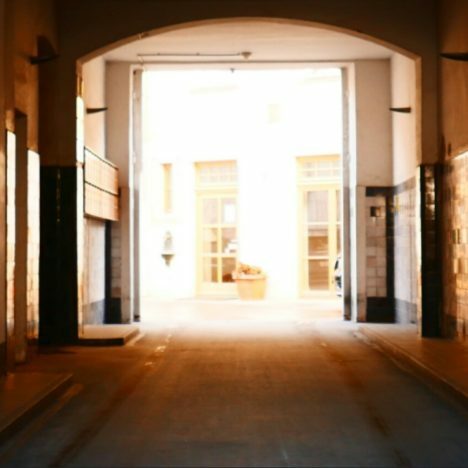 In case any of you designers read my blog, do you have experience in such a case? Hi, Diana! I am again very happy to hear from you :)Neo turned our so nice finally! Cute little fish 🙂 Though I see that It took quiet some time to finish it. I don’t know whether there is an issue with copyright in this case. I made a Russian cartoon character recently, and also thought of making a pattern for it. Disney holds the copyright to the animated clownfish character, Nemo. But, you can publish a clownfish pattern. or is it the same beginning from your other fish pattern?